Labour MPs who have quit the party should “resign and put themselves up for election”, Jeremy Corbyn has said. In a Twitter video, the Labour leader said it was the “democratic thing to do” because they wanted to “abandon the policies on which they were elected”. Eight ex-Labour MPs have formed a new independent group, with three former Conservative MPs joining their ranks. Another senior Conservative, Dominic Grieve, has said he would quit the party if there was a no-deal Brexit. The former attorney general told the BBC’s Newsnight he admired the courage of the 11 members of the Independent Group and agreed totally with their support for another EU referendum. He said he would not be able to stay in the Conservative Party if it “went completely off the rails” and backed leaving the EU without a negotiated agreement. Other Labour MPs have said they will consider their futures unless Mr Corbyn listens to their concerns about the culture of the party and acts on them. While the Labour leader said he was disappointed by the defections, he suggested the eight were replaceable and the Labour movement was “greater than the sum of its parts”. “It is disappointing that some MPs have left our party to sit with disaffected Tory MPs, but we can’t return to the failed business of usual politics of the past,” he said. Momentum, the Labour movement backing Mr Corbyn, is to hold “mass canvassing events” in the constituencies of some of those ex-Labour MPs to build support in the event of a by-election. 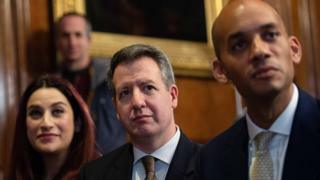 It says it will have events in Streatham, Stockport, and Penistone and Stocksbridge – the constituencies of Chuka Umunna, Ann Coffey and Angela Smith respectively – in the next few weeks. The Labour leader said he would not change direction in response to the defections but repeated that tackling anti-Semitism was a priority for him. He has been accused by departing MPs, including Joan Ryan and Luciana Berger, of allowing a culture of “anti-Jewish racism” to flourish and for Jews to be “abused with impunity” by his supporters. One of Mr Corbyn’s senior team, Barry Gardiner, apologised to the Jewish community in the House of Commons on Wednesday, saying it had “let them down” and Labour was “struggling” to “become the party we have always aspired to be”. Mr Corbyn said he recognised the party had work to do to restore trust among the Jewish community and to persuade people the party was its “ally” in the fight against anti-Semitism. “I want to make it absolutely clear that I regard the fight against anti-Semitism as an absolute priority and we’re utterly determined to root out anti-Semitism from our party and our society. The party said it had suspended the membership application of left-wing firebrand Derek Hatton over Twitter comments he made about Israel in 2012. Lord Mandelson told ITV’s Peston he felt “morally compromised” staying in “a party that can spew out so much hatred towards other members”, but he also urged Labour MPs not to leave the party. 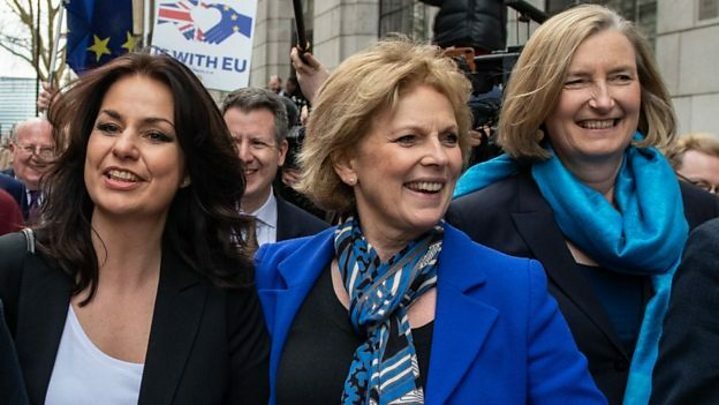 Senior Conservatives have suggested the door is open for the three Tories who quit the party on Wednesday, Anna Soubry, Heidi Allen and Sarah Wollaston, to return one day. Media captionAnna Soubry tells Newsnight’s Kirsty Wark she was ‘worried’ the prime minister had a problem with immigration. Foreign Secretary Jeremy Hunt said he hoped they would be “welcomed back” if the government could demonstrate Britain remained an open and outward looking country after Brexit. Ms Soubry has insisted there is no “going back” since one-Nation Tories like her had lost the fight for the heart and soul of the party and been overwhelmed by a “purple Momentum”. And Ms Allen said she could not imagine returning “because if we do our jobs right there won’t be a Tory party to go back to”. She also told ITV’s Peston that “a third” of Tory MPs shared her frustrations at the direction of the party. Prime Minister Theresa May has rejected claims the party has abandoned the centre ground in its pursuit of a hard Brexit, pledging to continue to offer the “decent, moderate and patriotic politics that I believe the people of the UK deserve”. The Times reported that David Cameron, Mrs May’s predecessor, staged a last-ditch bid to persuade the three – two of whom were elected in open primaries championed by him – to stay. Mr Cameron said on Twitter he respected their decision but disagreed with them.